​As the Trump Adminstration seeks record U.S. arms sales and renewed military engagement in places such as Afghanistan, there are increased risks of corruption undermining U.S. foreign policy and national security goals. Globally, the arms trade is highly prone to corruption, and there have been several cases in U.S. courts of bribery in the past few years. However, it appears U.S. regulators are weakening some key anti-corruption measures. This will put extra pressure on U.S. officials and companies attempting to address corruption as well as to ensure weapons transfers are not diverted to criminal or terrorist organizations. Please join experts with experience in U.S. export enforcement, tracking the U.S. and global arms trade and corruption, and U.S. military engagement in Afghanistan to discuss these new and ongoing challenges. They will also offer new recommendations on what can be done to better address corruption in the arms trade. 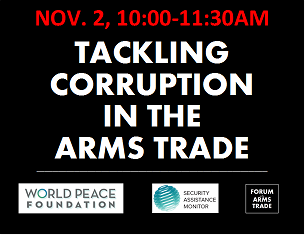 This event is co-hosted by the World Peace Foundation, Security Assistance Monitor, and the Forum on the Arms Trade. *For individuals unable to attend the event in person, you can call-in and even ask a question via Twitter using #TacklingArmsCorruption. Call in information will be sent following RSVPing. As digital technologies rapidly grow and the use of the Internet expands, so do the risks that accompany it. Cyber security capacity building efforts thus have become a priority, not only for governments, but also for the private sector and civil society around the world. U.S. partners from the Middle East and North Africa (MENA) form a key part of the Obama Administration’s anti-ISIS coalition. A recent Congressional Research Service report highlighted specific contributions, including at least 28 F-16s, from six MENA countries. Here’s a look at the total amount of U.S. arms sales and total number of participants in U.S. military trainings to all MENA anti-coalition partners from 2012 to 2014. The House Foreign Affairs Committee is holding a hearing on June 17, 2015 on U.S. Policy and Strategy in the Middle East and in preparation for the hearing, Security Assistance Monitor has created an inforgraphic to illustrate the significant increase in assistance to the region in the last few years. Tomorrow the Senate Foreign Relations Committee will hold a hearing on U.S. Security Assistance to Africa. Here are four important trends on U.S. military and police aid to Africa. A senior commander of the LRA turned himself in to U.S. forces; President Obama has pledged to continue supporting the government of Mexico despite calls to suspend military aid; Russia, Kazakhstan and Azerbaijan announced they will hold their first ever joint naval exercises on the Caspian Sea; and the United States has begun training and providing equipment to the the Iraqi military.